Volunteer tourism (VT) is one of the fastest growing sectors within alternative tourism. It sells the idea that volunteers will contribute to development, alleviate poverty and build capacity, and claims to retain an equal, unexploited relationship with the local host community. The popularity of VT lies in its discourse of urgency, the impression that it is easy and that anyone can do it. The complexity of development is reduced to a few days or weeks of helping others, set to a backdrop of exotic scenery. South Africa offers the largest range of VT activities on the African continent and is also ranked amongst the top ten destinations for VT in the world. VT is a significant source of revenue for South Africa and yet there is little understanding of the potential benefits or harms on local communities. Although the local host community is the socalled beneficiary of VT, their perspective is of essence to the debate, yet often overlooked. This paper explores local actor’s perceptions of VT using social exchange theory. The investigation is a case study of a township community in Kayamandi, South Africa. Semi-structured interviews and participant observation were conducted to understand local actors’ needs, motivations, expectations and their evaluation of the benefits and costs. 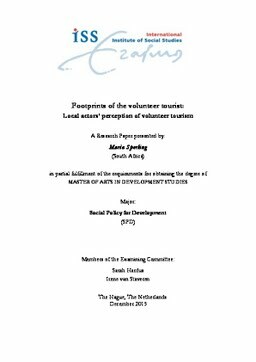 The findings reveal that local actors attach different definitions, and meanings, to volunteer tourists depending on their socio-economic roles. Broadly speaking, their perception of VT is positive with factors such as level of power, dependency, control, and trust, greatly influencing their perception. Social exchange theory served as a useful framework. Finally, the study highlights the potential of VT to bring change and development to a host community, especially if the communities themselves could have more control of the VT system.